Unforgettable chocolate fountains that cascade for hours – a real chocolatey indulgence for those wishing to showcase a stunningly contemporary chocolate fondue. Our Oil-Free Belgian Chocolate will enchant your guests as the seductive chocolate will flow from the top of each fountain into a luxurious pool of creamy delight at the bottom of the tower – that is, if your guests can resist it enough to let it reach the bottom! 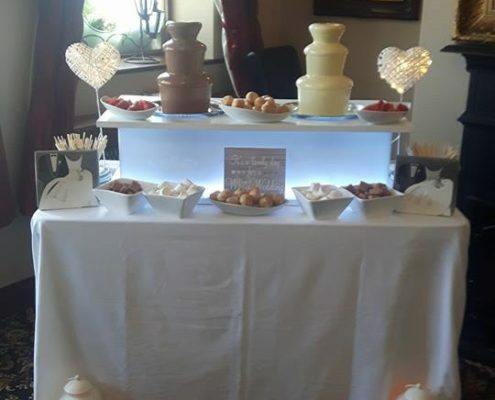 Our Chocolate Fountains, that are available to hire for your Wedding or Party, come encased in an LED light up surround base which includes a range of colours to suit your wedding or party theme. You can choose to hire our single Milk Belgian Chocolate, White Belgian Chocolate or you can have a truly unique experience and hire the White and Milk Belgian Chocolate encased in our Double LED light up surround base. 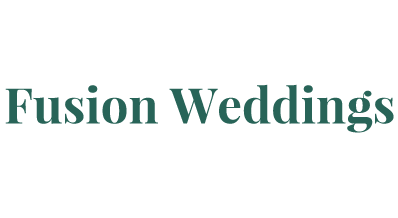 We cover all areas of the South East including Kilkenny, Carlow, Waterford, Wexford, Tipperary and also Laois, Offaly, Wicklow, Kildare, Cork and Limerick with prices starting at €270 plus travel. Our Belgian Milk Chocolate is the most popular of our Chocolate Fountains available to hire for smaller Weddings and comes in our unique LED Light up surround base. We include an attendant to serve your guests for up to two hours on the day. You won’t have a thing to worry about as we will have our Chocolate Fountain set up before your guests enter the venue for that WOW effect! You will have a choice of three dips to be chosen from strawberries, grapes, marshmallows, soft vanilla fudge, profiteroles and butter short bread. All skewers, napkins and plates are included with the set up and include a wedding theme. Please get in touch for availability on your Wedding Date and for price to hire our Single Chocolate Fountain in your area. Delight your guests with our unique White Belgian Chocolate Fountain and rekindle childhood memories of Milky bar kid , with fresh, succulent fruit and a variety of other scrumptious dipping items. 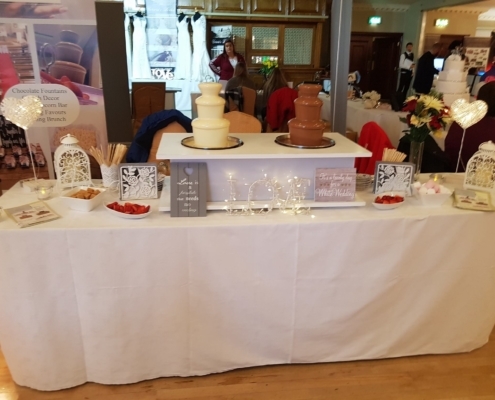 When you hire our Single White Belgian Chocolate Fountain, you will have a choice of three dips to be chosen from strawberries, grapes, marshmallows, soft vanilla fudge, profiteroles. All skewers, napkins and plates are included with the set up and include a wedding theme. Please get in touch for availability on your Wedding Date and for price to hire our White Chocolate Fountain in your area. 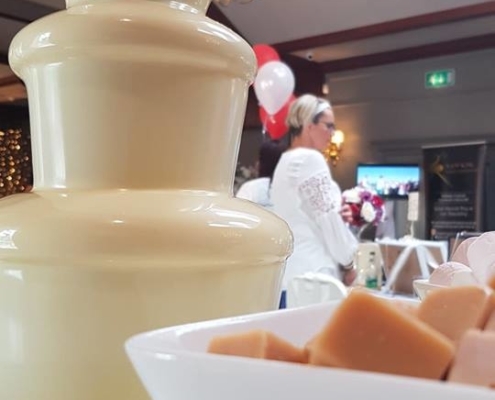 Double the Delight of your Wedding Guests and Hire our Double Chocolate Fountain and tease their taste buds with a choice of Milk Belgian Chocolate or White Belgian Chocolate or be totally indulgent and have one of each!! 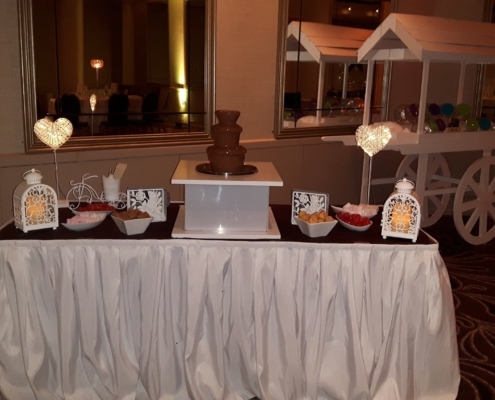 When you hire our Double Belgian Chocolate Fountain, you will have a choice of three dips to be chosen from strawberries, grapes, marshmallows, soft vanilla fudge, profiteroles. Extra dips come included with our Double Chocolate Fountain which makes it ideal for larger Wedding Parties. All skewers, napkins and plates are included with the set up and include a wedding theme. Please get in touch for availability on your Wedding Date and for price to hire our Double Chocolate Fountain in your area.